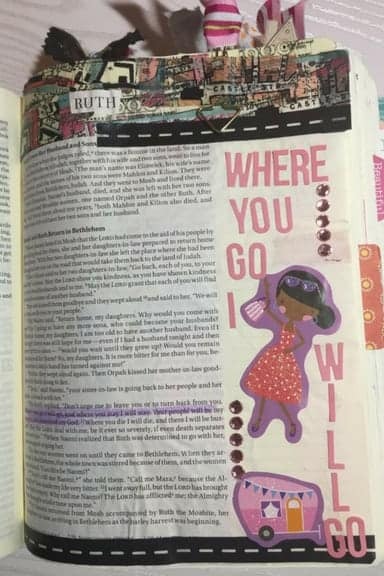 This week I’m Bible journaling on a budget with Dollar Tree stickers! Why? Well, because they’re awesome, but also because most of my stuff is in boxes waiting to be unpacked. I just moved into my new home and am surrounded by boxes, but I’m almost done! 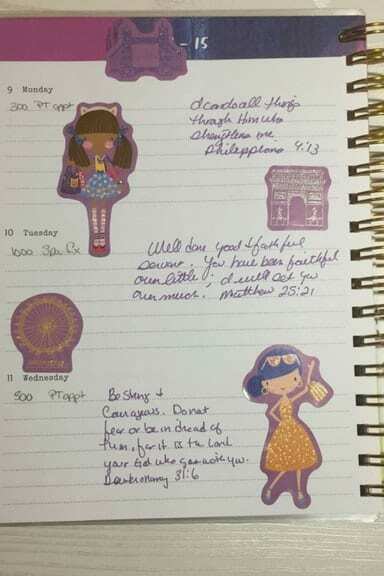 I took about a week off of Bible journaling to pack, move, and renovate my old house to get it ready for sale, but have desperately missed my Bible journaling time. I still read my devotional on my YouApp, but it’s not the same. 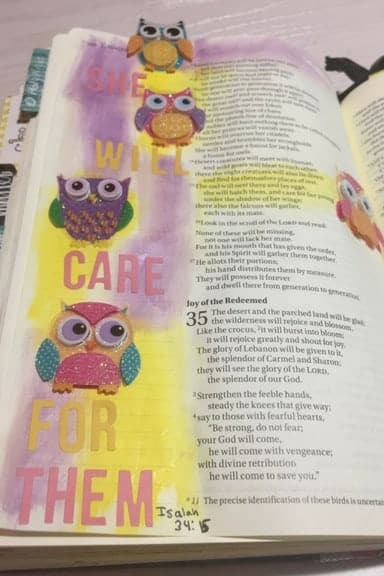 My heart sings more and I pay more attention to the Scripture when I’m Bible journaling versus just reading my app. Luckily there are about three Dollar Stores within a five-mile radius of my house, so it’s easy to stop by. Especially when there’s one next to the grocery store and my fridge is bare. Armed with a few dollars, I had a little shopping spree and came home to my time in the Word. Yay! I sure needed this. Links to some of the stickers I used are below. Please note that our ministry may receive a commission if you purchase something using our affiliate links. It doesn’t cost you more, but it does help us out. Thank you! I couldn’t resist the popup butterfly stickers. They are very adhesive and close up nicely when you close your bible. They also pop back up when you open it. You can find them at your local Dollar Tree or using this link: http://shrsl.com/11wnc. If they don’t come up when you click the link, then they’re all sold out. 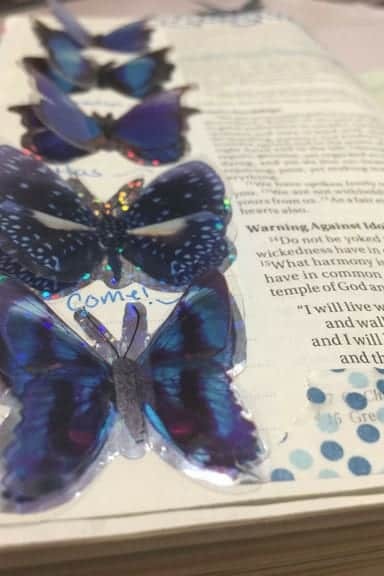 2 Corinthians 5:17-18 I love how these butterfly stickers pop up off the page. There the owl nests and lays and hatches and gathers her young in her shadows indeed, there the hawks are gathered, each one with her mate. Isaiah 34:15 – I found this old sticker pack in a box. I paid .24 for this set, but it wasn’t at the Dollar Tree. Minions are super cute! I couldn’t resist the washi tape and stickers so I grabbed them before they disappeared off the shelf. The washi tape is not available online, but you can find the stickers here: http://shrsl.com/11wnn. 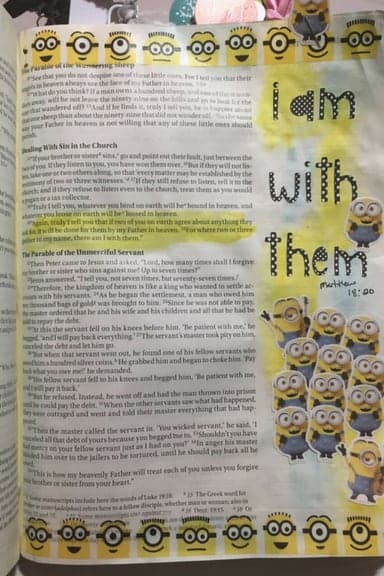 Matthew 18:20 – These cute minion stickers and washi tape were on an end cap at the Dollar Tree. I couldn’t resist. 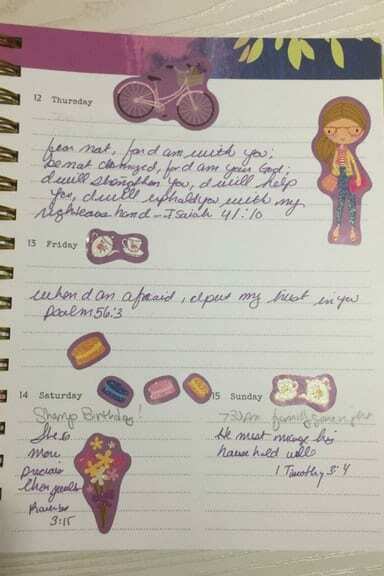 Philippians 4:13 – Bible Journaling in my planner. This is what I do with extra stickers. Wanna know more about my planner? Here’s a video that shares 15 different ways to use one. To purchase this exact planner, click here. Ruth 1:16 – I loved the camper and girls in dresses. This Dollar Tree sticker set is adorable. I did quite a few layouts with them. 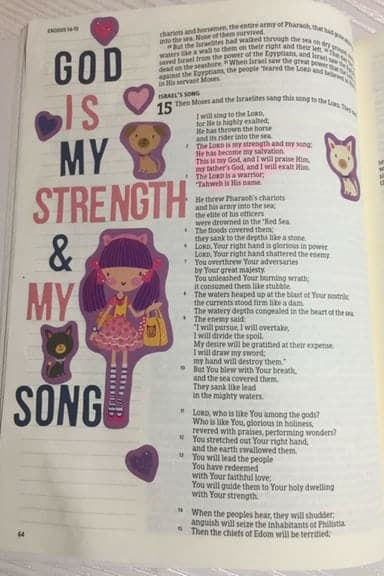 The Lord is my strength and my song, and he has become my salvation; this is my God, and I will praise him, my father’s God, and I will exalt him. The Lord is a man of war; the Lord is his name. 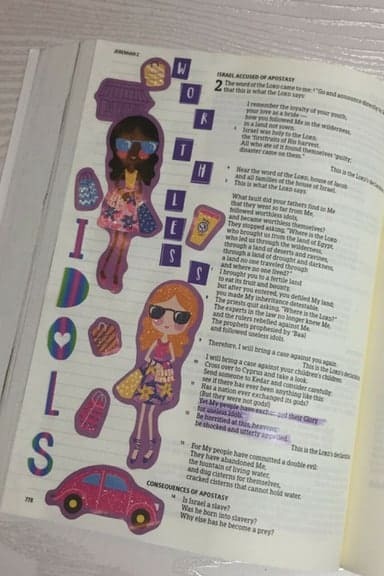 As much as I love Bible journaling on a budget with Dollar Tree stickers, the purple girls didn’t have as much stick as I’m used to having. One of the girls curled up on my planner so I had to add some glue behind her, which sort of defeats the point of having a sticker, wouldn’t you say? 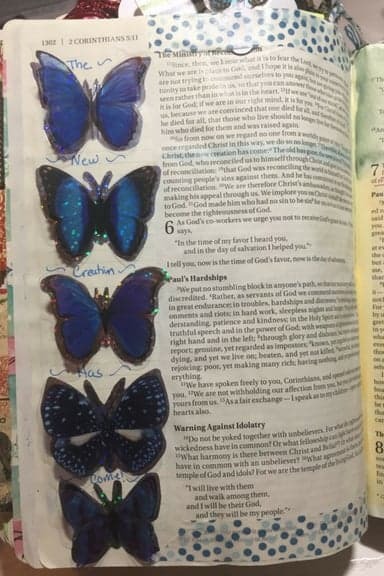 What are your favorite things to buy from the Dollar Tree (our Pound Store if you’re overseas) for Bible journaling?